Natural stone is one of the first building materials used by man. Its care and maintenance is one of the oldest tasks performed by our ancestors. With over 28 years in the business, our experience has developed with this beautiful material and with the addition of modern science will provide many years of beauty. We are one of the few area companies that specialize in the use of diamond and brick abrasives in the restoration of your stone surfaces. The use of diamonds and bricks in the grinding and honing phase of restoration will give you better clarity and more reflectivity after polishing. 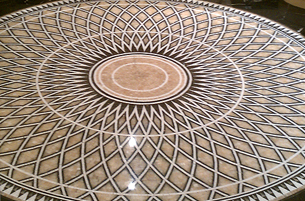 We also provide cleaning, sealing, crack/chip repair and stain removal for marble, granite, travertine, terrazzo and all other natural stone surfaces. Grinding:To remove deep scratches and remove lippage (uneven tile edges). This process is done by machine with Diamond/ Brick abrasives and water that creates no dust. Our lippage removal system is unique in that we are one of the only companies to still use the Frankfurt System of brick abrasion. This system is able to truly achieve the flattest floor in the industry. This is evident in many of our high profile jobs, as seen in Architectural digest. Honing: To remove minor scratches and wear from everyday foot traffic. This process is also done by machine with diamond abrasive pads and water which creates no dust. Stripping: To remove coatings that block stone's ability to breathe which causes spalling (when the stones crack, pop and shale). Some examples of common coatings are some types of crystallizations, janitorial waxes, and polyurethane. In order to keep your natural stone at its original appearance and protect it from staining, scratching and dulling we are able to visit you on a regular maintenance basis. 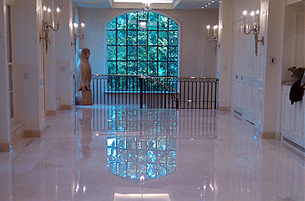 We will attend at scheduled intervals (high or low frequency visits) to maintain and re-polish your natural stone. 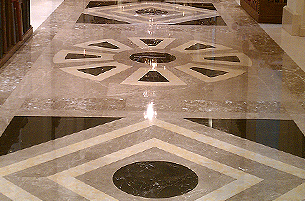 Maintained stone gives visitors the impression that they are inside of luxury building or apartment. Our maintenance visits will help to keep your stone areas looking new throughout the years.